Want to decorate for the Thanksgiving holiday, but you don’t want to spend a lot of money? I hear you. And while I enjoy all the great DIY and crafty ideas on Pinterest and elsewhere, this season is awfully busy. 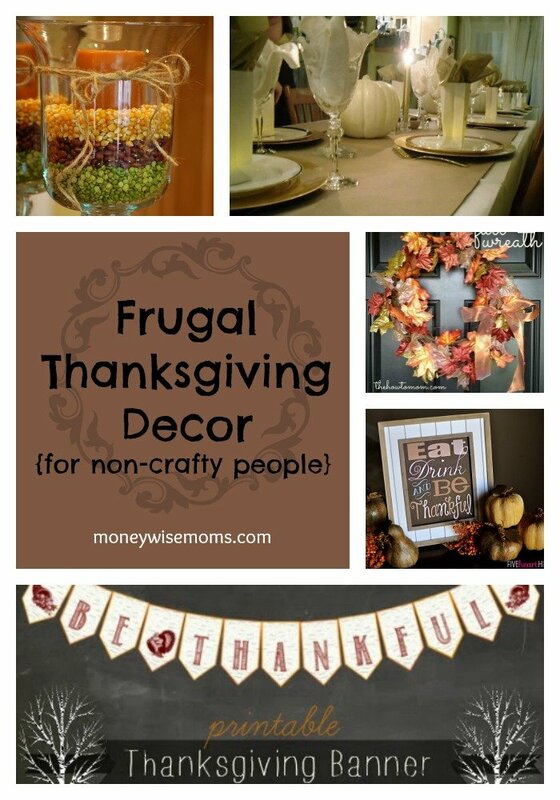 I need easy frugal Thanksgiving decor ideas–you, too? I’ve pulled some of my favorites off my Fall & Thanksgiving board with a goal of helping non-crafty people add a little atmosphere to the holiday. I often hear “but I don’t DO crafts,” from my friends and readers, so I promise that these are all really easy. 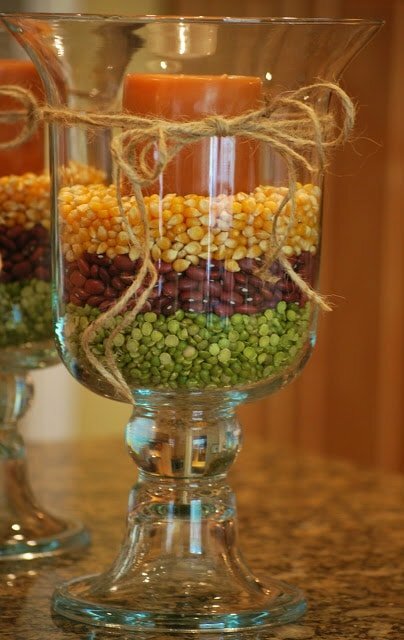 I love how Amanda Jane Brown used popcorn and dried beans in hurricane vases for a frugal but elegant look. You could add candles as well. If you don’t have hurricanes at home, look for tall cylindrical vases at Dollar Tree. You may be surprised how sophisticated a roll of Kraft paper can look on your Thanksgiving table. This post at The Kitchn shares many ways to use it, including more graphic & fun ways, plus your guests can doodle or write what they’re thankful for while they’re waiting for their pie. 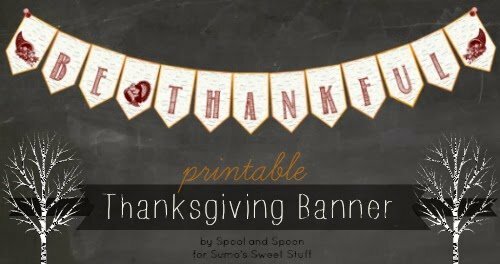 You can find lots of printable Thanksgiving banners online, but this one from Sumo’s Sweet Stuff has two sayings to choose from: Be Thankful or Be Grateful. Just print the three sheets out on cardstock, cut them out, and tape onto ribbon, yarn, twine, etc. for a simple banner. 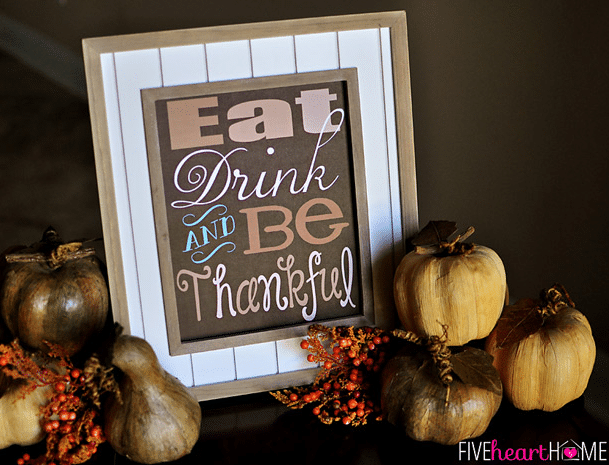 Printing and framing a piece of word art is one of my favorite ways to decorate frugally for the holidays. This year, I’m using this stylish Eat Drink and Be Thankful from Five Heart Home. Just print it out on a piece of cardstock and add to any frame. 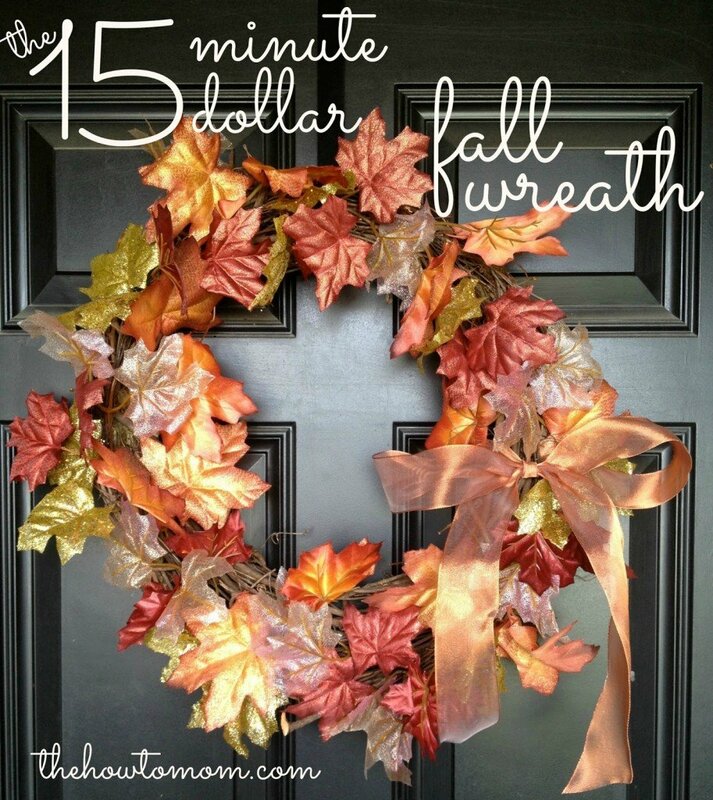 Greet your guests at the door with a gorgeous fall wreath you can enjoy all month. This tutorial from The How To Mom shows you how easy it is to wrap a leafy garland around a wreath frame. She uses pins to hold it in place, but glue would work too. You could even hang this indoor for some lovely color and texture. While I suppose this technically is a “craft,” it is simple enough for anyone to do, even a non-crafter. So what do you think? 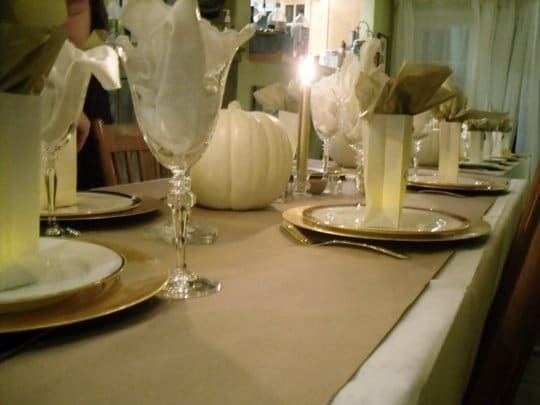 Easy, frugal Thanksgiving decor can look really nice while not costing a lot of time and money.